Although there is much talk in art journals of the ‘drive for equality’ across all mediums in 21st century art, there remains a resistance towards ceramics entering the contemporary art scene. 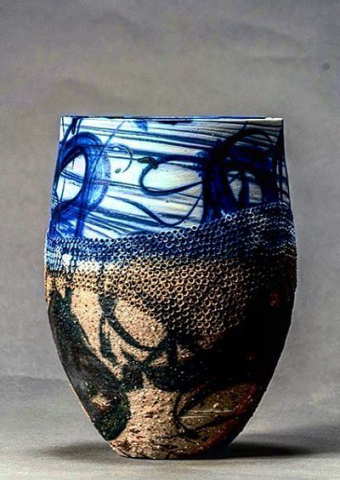 Aside from a handful of nationally recognised Australian ceramicists, such as Gwyn Hanssen Piggott, Les Blakebrough and Milton Moon, most ceramic artists do not receive recognition beyond their field. Ceramic publications frequently discuss this ongoing reception, arguing that the use of function to divide fine art and craft is no longer valid – if indeed it has ever been. The notion of fine art being defined as a unique object produced to bring about an aesthetic experience, as distinct from objects produced according to a definite concept of the object, has its genesis in Kant’s Critique of Judgement. Yet, we only need to look at the work of Edmund De Waal, Britain’s best-known potter, to see shortcomings in Kant’s theories. 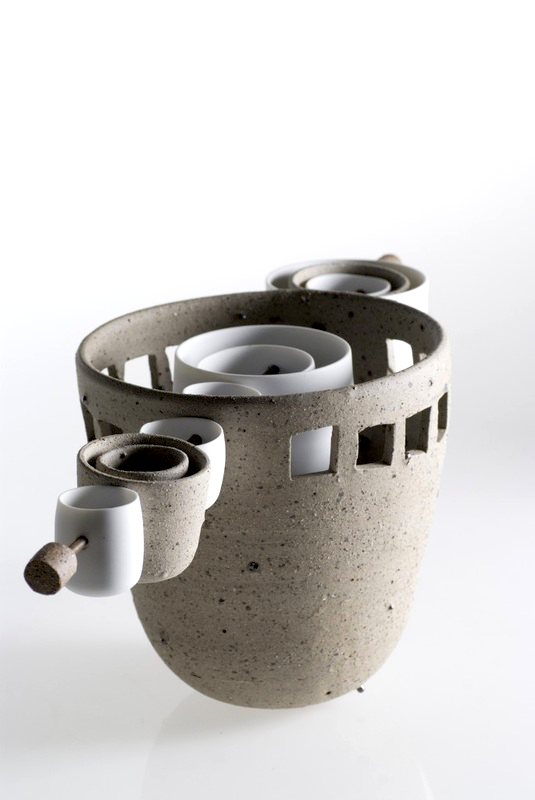 Demonstrating that the vessel form can operate on a conceptual and functional level, De Waal argues: “It’s perverse to think that you can’t be a serious contemporary artist and make pots.”  In our Australian art scene, however, the shadow of Kant’s legacy still influences the reception of ceramics. In common with De Waal, Megan Puls’ wafer thin vessels demand to be considered in a context beyond their form. Inspired by the wetland habitat of North Queensland, Puls’ current exhibition, Bloom, explores the patterns of tidal watermarks, mangrove roots and the burrows of crustaceans found in coastal mudflats. Following in the tradition of Gwyn Hanssen Piggott, Puls presents her work in groupings with a strong narrative element. ‘Each cluster of vessels tells the story of different aspects of the wetlands – from the waves of the ocean through to the crabs and the birdlife’, Puls explains. 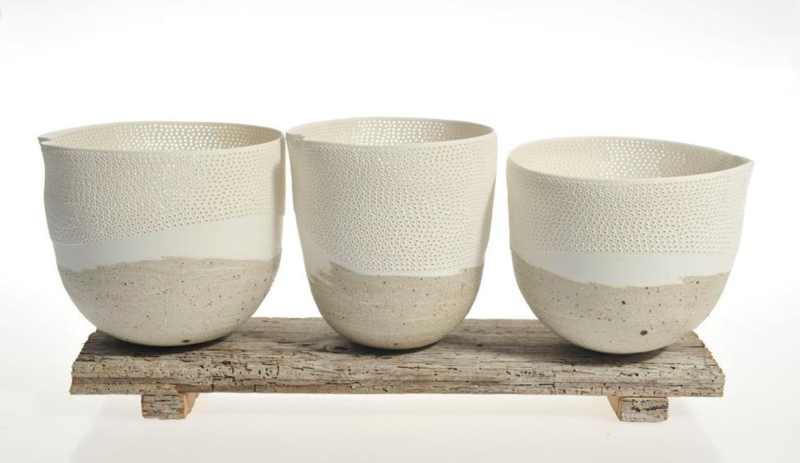 Organic in shape and quiet in nature, these vessels evoke the beauty and fragility of this complex ecosystem. Transgressing the need of function traditionally associated with ceramics, Puls’ visual language is concerned with the balance between opposing qualities such as smoothness and texture, stillness and movement, and vertical and horizontal. The Ebb Tide series is a collection of slightly askew-shaped porcelain bowls. Displayed in small groups nestled inside each other, these bowls mimic the manner of sea crabs seeking protection within larger shells in the ocean. Another grouping, Mango, has undulating lines carved into the sides of porcelain bowls to suggest the dense root systems of mangrove swamps. 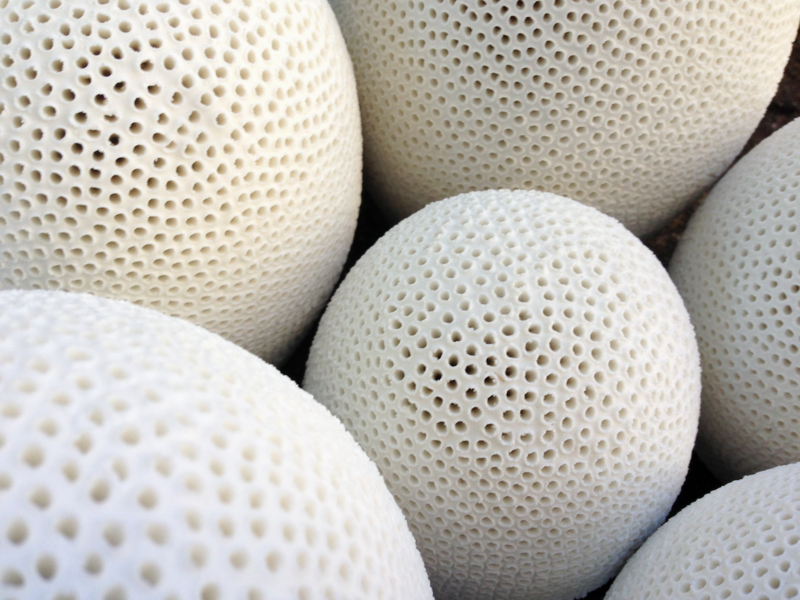 The upper and lower portions of the bowls are pierced with miniscule holes reminiscent of tiny crab burrows. Linked by the subtle relationships of form and texture, these works point to the inter-relatedness of flora and fauna in the tidal zone. 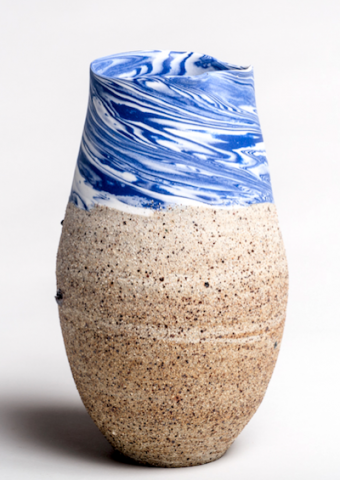 The most striking individual piece in the show is Inlet – a large asymmetrical vessel depicting an aerial perspective of the convergence of the ocean and mudflats. 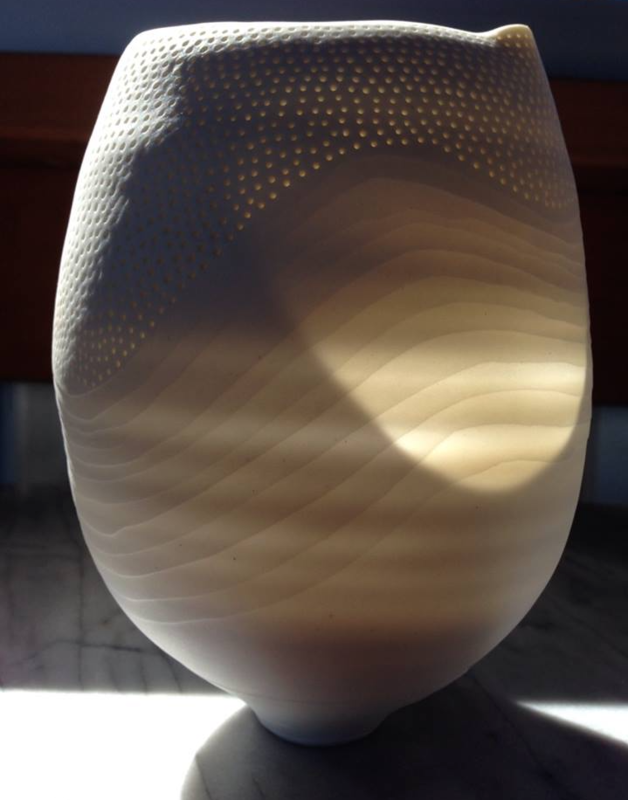 In the top section of the vessel, streaks of cobalt oxide are mixed with smooth white porcelain to represent tidal waters. Beneath this section, recycled clay in earthy hues has been multifariously rubbed and pierced to represent the mudflats. The combining of the two clays requires great technical accomplishment due to the differing degrees in shrinkage between porcelain and clay, yet the contrasting textures and patterns sympathetically portray the diverse elements in the wetlands. Environmental themes are familiar ground for Puls. Previous solo shows include Landline , a series on soil strata, and Reserve and Conserve  that focused on water conservation. Based on the Gold Coast, Puls exhibits nationally and internationally. In August, she received the Acquisition Prize in the International Cup Competition in Alberta, Canada. 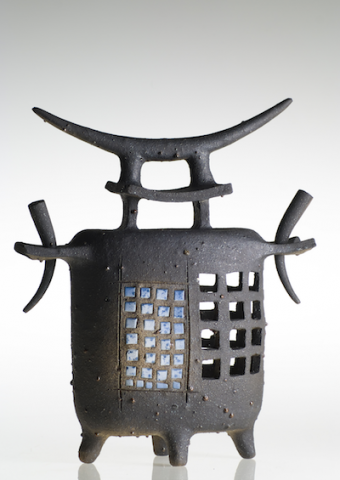 As a mature ceramic artist at the height of her career, Puls is still to be recognised in the wider contemporary art scene. 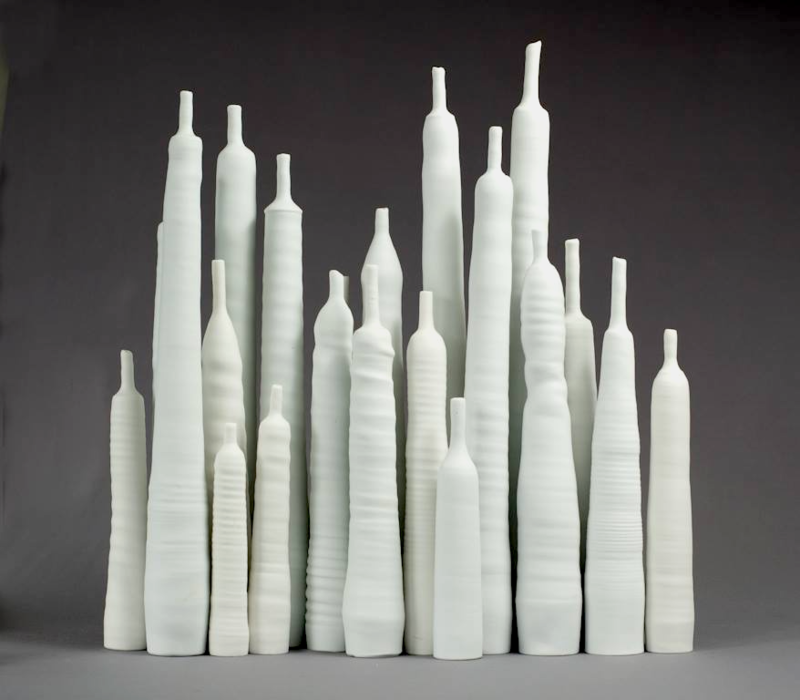 Megan Puls is one of Australia’s more successful ceramic artists. Her work has featured in art competitions, festivals, magazines, books and is in collections internationally. She is known for her ability to throw and sculpt very large works. Music Courtesy: Maurice Gendron, Ombra mai fu, George Frideric Handel. Fairley, Gina. Globility: The New Globalisation. In conversation with the artist. http://meganpuls.com. GoMA, Brisbane. Review of 21st Century: Art in the First Decade. Art Monthly Australia 238 (2011): 5-8. Foulds, Gordon. Melding the Variables: Megan Puls. Crafts Arts International 85: 55-57. Gray, Laura. On the Transgressive Nature of Ceramics. 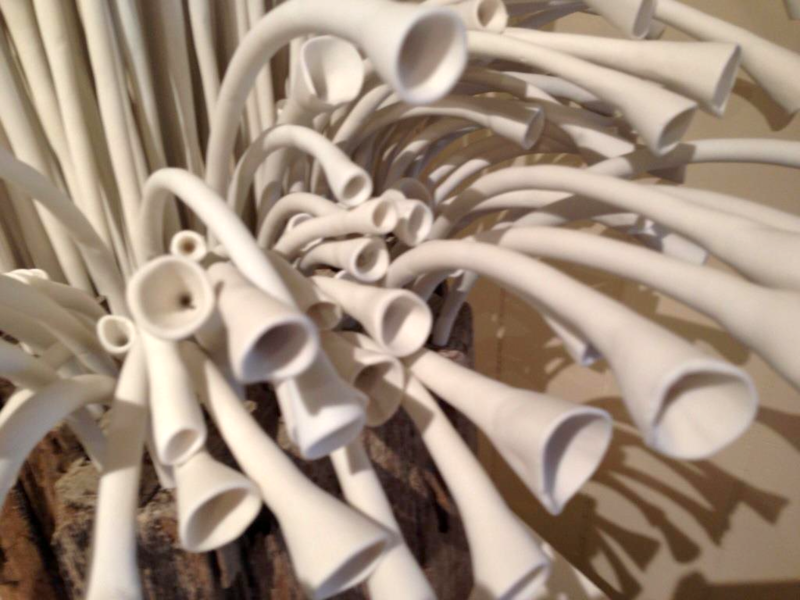 Ceramics: Art and Perception 89: 100-102. Kant, Immanuel. The Critique of Judgement. Translated with Analytical Indexes by James Creed Meredith. Oxford: Clarendon Press, 1952. Inspired by the natural landscape. Particularly the extraordinary and ever-changing world of the wetlands.